See the NBO Scout Training Team home page for current C-911 news. 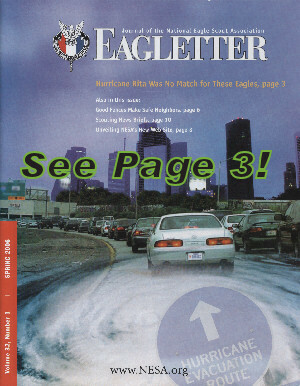 Hurricane Rita is gone but not forgotten! It is nothing short of amazing what our Scouting community accomplished September 22 through September 25, 2005 as we, along with our friends and neighbors assisted the many people displaced by hurricane Rita. As most of you know, Crew-911 along with the unfailing resourcefulness of BSA Troop 777... as well as help from many other area troops and our OA Brothers supported the American Red Cross shelter operations at McCullough Junior High School. Their were many other shelters and Scouts were their too. I know first hand what went on at McCullough though and it was awesome! C -- Plan to schedule or to attend an American Red Cross "Shelter Operations Introduction" program.... The material presented is appropriate for both youth as well as adult members... Members of your chartering organization are also an appropriate audience for this program too which will give everyone a better understanding of "the big picture" of how a shelter actually operates...and how you can best help out. This program is free and can be presented in about 2 hours... It is extremely informative and fun when properly presented. D -- Plan to get your FA/CPR training current... both your youth and adult members... See our training schedule at BSA Camp Strake for available dates... Classes are also held at the main ARC Chapter at Hwy-59/Kirby and at the Northern Branch Office in Conroe. E -- Plan to have your older, Venturing age Scouts participate as a patrol in a Wilderness First Aid Basics program... This program prepares you and your boys to work as a team to handle an emergency when professional care will be delayed. This is a fun program... See our training schedule at BSA Camp Strake for available WFAB training dates. 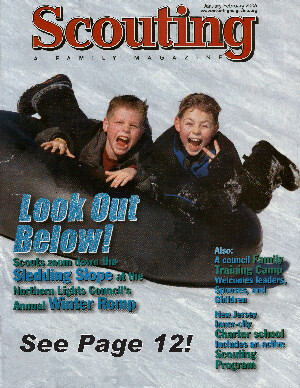 BSA Crew-911 Member Brent put together this special video promoting our crew. This is a fairly large download and is recommend only for those with a high-speed connection. We had to compress this clip to use on the site so the quality is not as good as the original. Great job Brent! Show this off to your friends.... Enjoy! You might want to right-click on this and download it... please keep the times you stream it from our web site to a minimum! We do have cd copies of the original, higher quality version available too if you need it to promote the crew. We need more 14-15 year old members! BAT-Instructor and Emergency Response/Lifeguarding is coming up too so we have an excuse to recruit! 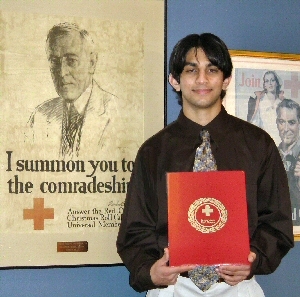 BSA Crew-911 Member Vishar can now add the prestigious American Red Cross Woodrow Wilson Award to his very long list of accomplishments! Vishar is the first youth volunteer to receive this recognition in The Greater Houston Area Chapter. Candidates for The Woodrow Wilson Award are reviewed and only a very small number are approved by the National organization. The first level of this award is then presented by the Chapter. The award is presented for exemplary volunteer service to youth volunteers under twenty-one years old. At seventeen, Vishar is among the youngest in the country to receive this award. Vishar is an Eagle Scout and has received his Bronze Award in Venturing. Vishar is a Vigil Honor member of the Order of the Arrow and an American Red Cross an Emergency Response and Wilderness First Aid Basics instructor as well as a trained First Responder. He was recently named as a National Merit Semi-finalist. 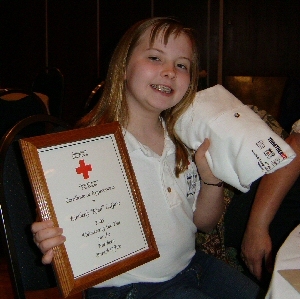 Northern Branch Office youth member Kimmy our first and only NBO Scout Training Team/BSA Crew-911 mascott was selected as the American Red Cross, Northern Branch Office VOLUNTEER of the YEAR for 2004! Kimmy is the youngest volunteer to receive this award presented annually by the Greater Houston Area Chapter. 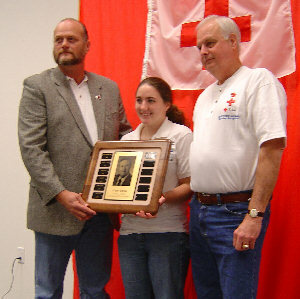 The GHAC is among largest American Red Cross Chapters in the country and the Northern Branch Office, headquartered in Conroe is the supporting office for The NBO Scout Training Team. This office operates the largest BAT Basic Aid Training program in the country. 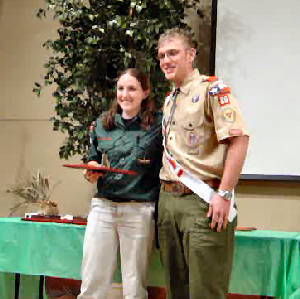 Kimmy helps the Training Team and The American Red Cross train over 1,500 Scouts and leaders each year. She assists with the BAT program and is the perfect victim for our Emergency Response and Wilderness First Aid Basics scenarios.